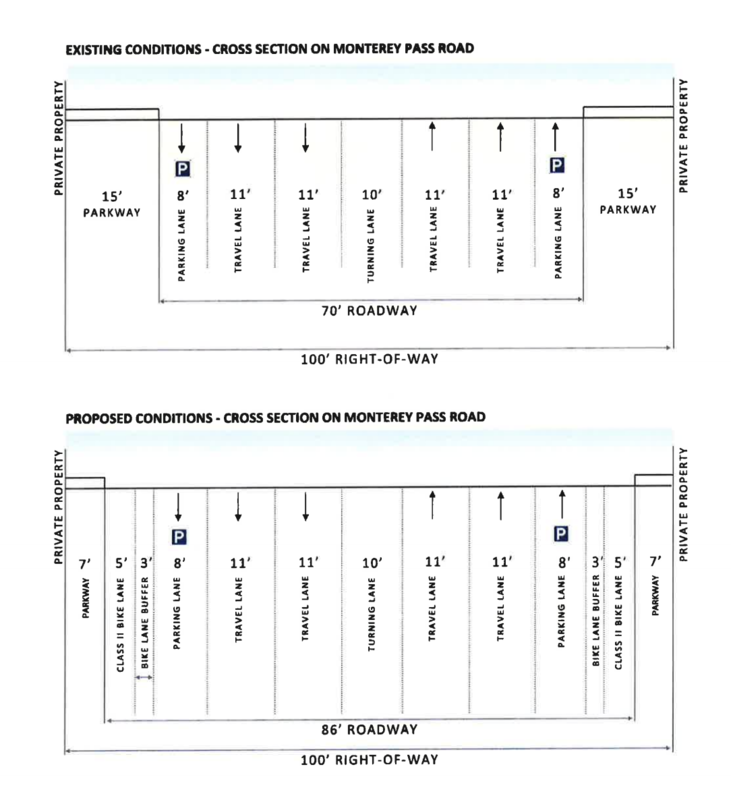 Tonight the Monterey Park City Council will be deciding how to proceed with a planned complete streets project for Monterey Pass Road. The decision is expected to be a close one, so Bike SGV is encouraging supporters to attend the city council meeting and speak in favor of the project. The meeting will take place tonight at 7 p.m. at Monterey Park City Hall Council Chamber at 320 W. Newmark Avenue. The project, officially the Monterey Pass Road Complete Streets Bike Project, would extend 1.6 miles from Floral Drive to Garvey Avenue. It is the least hilly route through a fairly hilly area, making for convenient bicycle access to East L.A. College and to the eastside Gold Line’s Atlantic Avenue station. The planned project would preserve existing through and turn lanes, and all parking. It would narrow a wide, partially-landscaped parkway to provide new parking-protected bike lanes. The project would also add new sidewalks, and replace aging water pipes. The project is anticipated to cost roughly $4 million. The city received Metro Call for Projects funding for half of this expenditure. Tonight’s vote will be to accept the Metro funding and to commit to providing a 50 percent local match. At a council meeting late last year, the project failed to get sufficient council votes to proceed, reportedly due to a lack of outreach to businesses along Monterey Pass Road, some of which have expressed concerns about construction impacts. Since then city staff have hosted specific meetings to get information to businesses and hear their concerns.